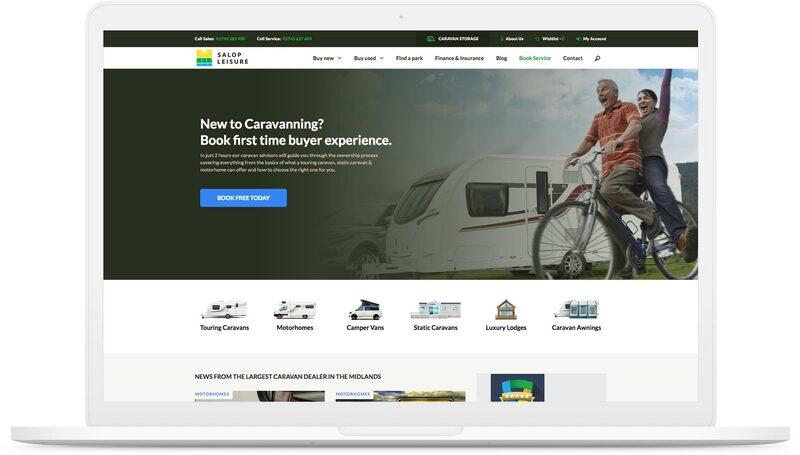 ﻿ A Caravan Dealer Digital Marketing Case Study - Must Read. Can my car tow this touring caravan? Answering this question allowed us to generate £160,000 in sales revenue. All images and stats mentioned in the below case study are accurate from publishing date (2018). 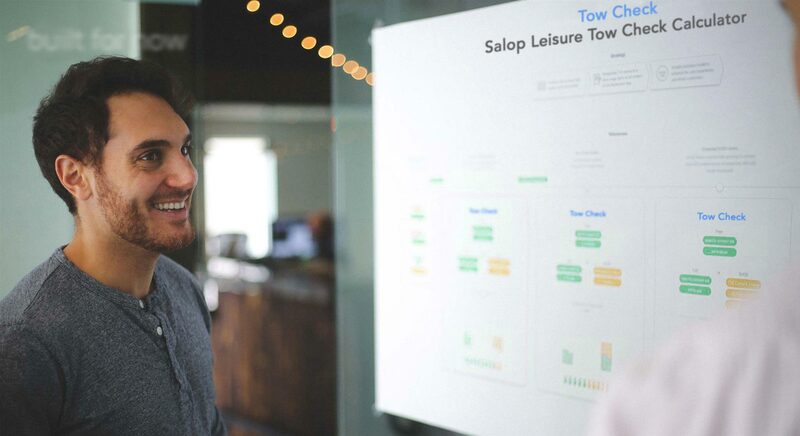 Since 1966, Salop Leisure has helped countless customers escape everyday stresses and turn life into an adventure. 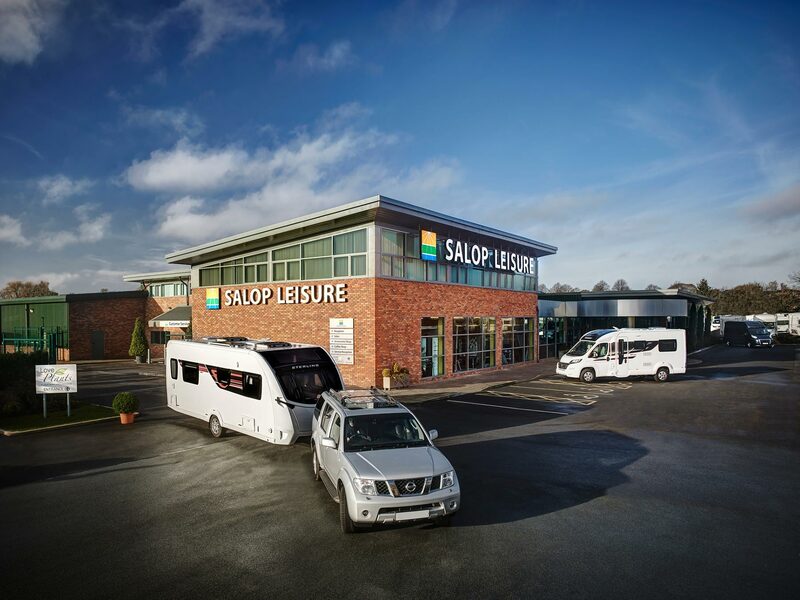 As one of the largest caravan retailers in the UK, Salop Leisure is the go-to retailer for every kind of a recreational vehicle or caravan holiday home. Marketing a big-ticket product like a caravan online requires an understanding that the customer journey for this type of transaction is altogether different from that of everyday e-commerce. People think and behave differently depending on if they are buying cheap or pricey products, and the customer journey for high-value items is more similar to B2B sales than B2C. While we had large amounts of traffic, and a good number of leads flowing through our website, we needed more Sales Qualified Leads (SQLs) which we could put into the capable hands of the touring caravan sales team. 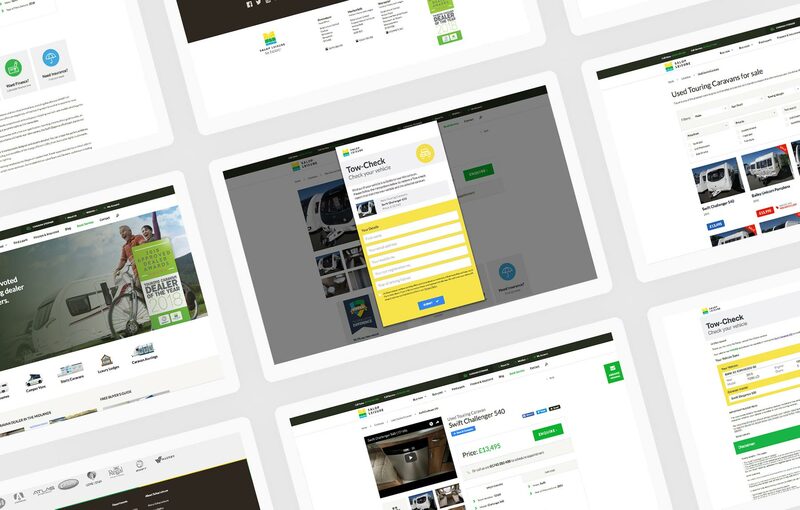 We contacted Built For Now who are specialists in generating leads - and asked them to come up with ideas on how we can create more SQLs from our website. They did not disappoint! What Are Sales Qualified Leads? Built For Now started by asking the touring caravan sales department which kind of leads they value the most. They were specific in their response. They described hot leads as being worthy of a direct sales follow-up, generally via a phone call. On interviewing the sales team and mining the data from previous enquiries, it was evident that the touring model sales page needed to go beyond merely listing the usual details such as product description, pricing, and specifications. One frequent customer request related to vehicle towing capacity, and if their car could tow a touring caravan of interest. The sales team confirmed that this question was often asked when the customer was in the dealership, which proved to us that prospects valued this specific information, and that it was not readily available online. The calculator was developed to be mobile friendly and support all vehicle manufacturers’ weight safety ratings and warnings. All prospects had to do was fill in a short form with their contact information, vehicle registration number and the year of their driving licence. 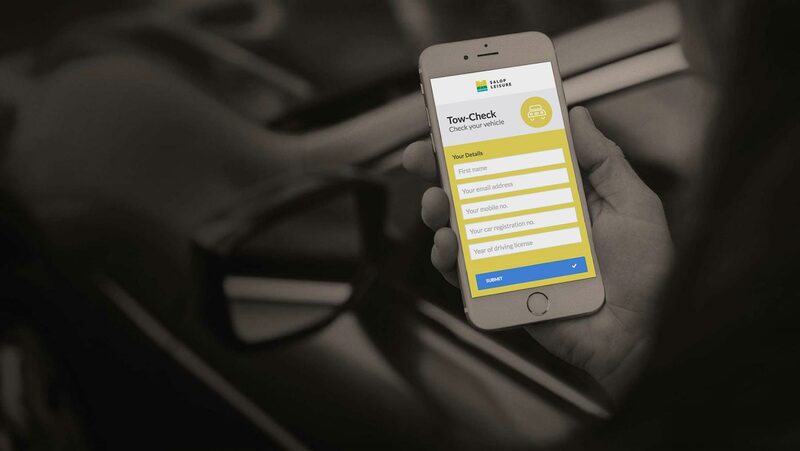 Once they hit submit, a tow check report would be emailed directly to their inbox, confirming if their vehicle can safely tow the touring caravan they’re interested in. After a tow check report is submitted, a nudge notification email is also sent out to the touring caravan sales department. This alerted them to follow up with a telephone call to ensure that the prospect had the information he or she required, and to assist if further information was needed. 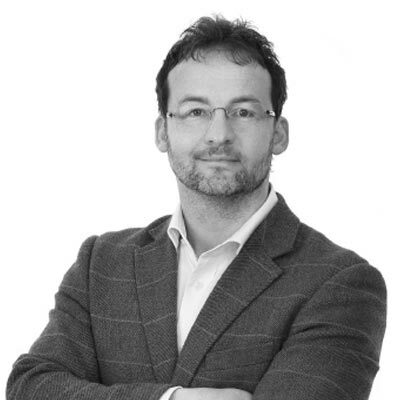 "Built For Now are one of the best agencies we have used. They don't build websites, they build solutions to meet our marketing goals. Their work has the power to change your business." Joint Managing Director, Salop Leisure Limited. 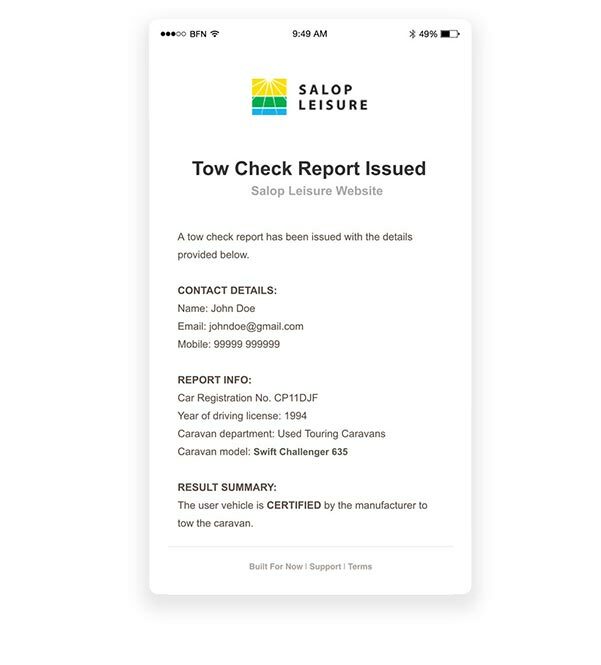 The project to build the tow check calculator took us around 3 months to complete, and would not have been possible without the amazing support we received from the touring caravan sales department. The application is still delivering an average of 2 sales qualified leads a week; a positive rate for a product that costs an average of £20K.